An American pastor named Gloria, who we met in Jerusalem, told us once something really wise. She said, in regards to what we witness in the Occupied Palestinian Teritories, that we should feel the pain, but do not feel broken by it. 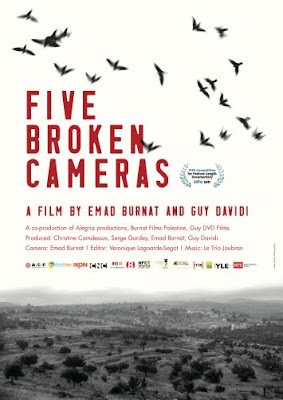 „Five Broken Cameras” leaves me broken, nevertheless it is one of the most important and eye- opening films showing the everyday reality of the occupied people. The saddest conclusion is that the story of Bil’in that the film explores is not the exception. Bili’ins happen on the daily basis in the West Bank. Five broken cameras later Jibril, Emads youngest son is already 4 yo. By that time his eyes have witnessed the the settlers burning their olive trees, the wall being built surrounding the village’s land, the nearby settlements have been erected. He had seem the soldiers entering his house in the middle of the night, his father's arrest and ....his favourites uncle’s Phil death. Phil, the village superhero, was mortally shot in one of the protests. Emad’s camera captures it with the cold blood. So do Jibril’s eyes. Is he still a a child when he kisses a poster of dead Phil hanging on a wall in front of his house? I don’t know. The film ends with what might look like a villagers’ huge success. After few years of struggle the thy finally received a court order to change the route of the wall. And than, after another few years of protests they actually saw Israelis executing the the court decision and moving the fence by few meters. After so many years of struggle and so many broken or wasted lives the success that finally arrives has a bitter - sweet taste. Certainly, the villagers of do Bil’in celebrate. Success like this one does not happen very often. But the reality is that the victory comes way to late too be really appreciated. It comes too late to allow things to go back „to normal”. 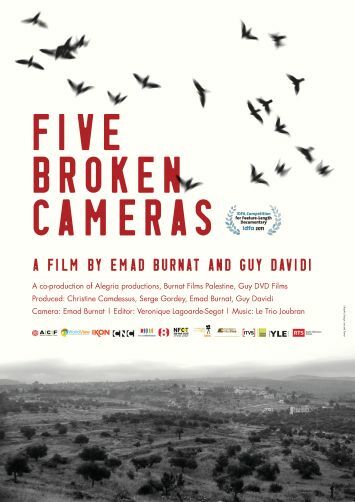 Guy Dadivi, the Israeli co - director of the film said that he thought that the filming was a healing process. Yes, in a way I can see how sharing this testimony can be a way of coping with the trauma that both Emad and Guy experienced documenting the events. Therefore, at the end of the day, for me, the film is about endless exhaustion and senseless waste of lives in the West Bank. It’s about the the only real struggle that is going on in Palestine right now .... a struggle to survive. This is truely honest film, it comes back to what film used to be and art of capturing the moments as they are. After it you have no doubt that you have faced truth. Even if this is difficult one.